What a delight it always is to catch up with Caz Little, founder of Dashing Hounds. Caz and I first met in 2000 as design students at fashion school, both hard workers, down to earth and ready to take on the world of fashion. After our few years of study we worked together in our first full-time jobs in the industry in Melbourne, gaining a grounding and putting in long hours immersing ourselves in learning the ropes of what was to be our careers for many years. A few years on we again worked together, this time in menswear, often reminiscing on all we had learnt – and how much more we wanted to do. 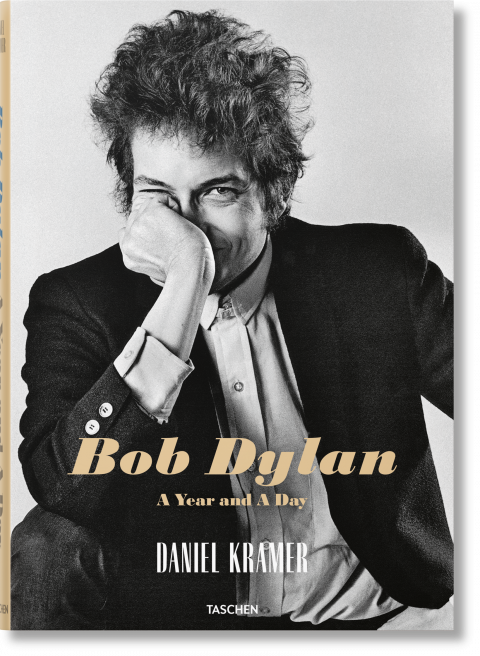 Fast track to 2013, some 13 years after we first met and we are both addicted to and in love with men’s styling. Caz founded Dashing Hounds in 2012. An inevitable step for her after years designing menswear for brands such as Lee and Elwood. She had experience working with Channel Nine and Ten in their wardrobe department however was still working other jobs to support her love of styling. It was in 2012 after her return to Melbourne after a brief time in Sydney that found Caz wanting more than just design. She wanted to do what she was most passionate about, and do it as much as she could. Waking at 3am one morning she decided she was going to do just that and live and work her passion, what she wanted to do from the beginning – be a stylist, and be a stylist for men. This started her mind ticking, knowing this could be a reality. She saw a font she loved, took a screen shot and woke a week later, again at 3am (fast becoming her hour of inspiration!) and thought “Dashing Hounds”. Excited at the prospect she could feel it all coming together she went for a 4am walk, mind racing, the name had stuck. 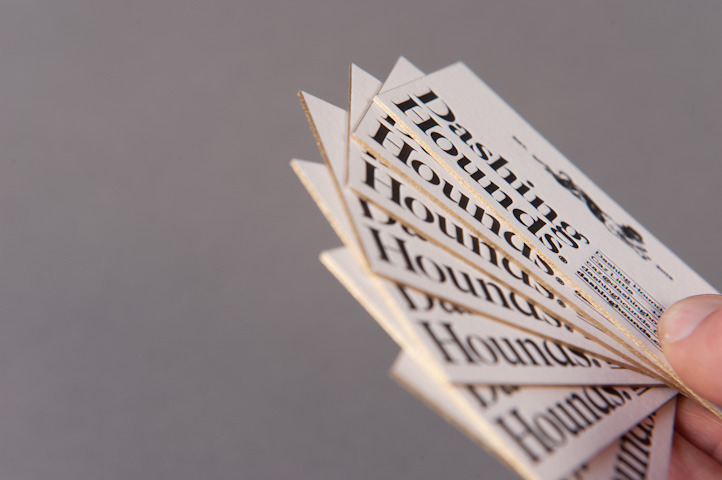 That night at a dinner she was telling her friend Shane Loorham of her 3am inspiration, the font and Dashing Hounds. Have it be one of those ‘talking to the right person at the right time’ moments, he went on to tell her about the font (he is a graphic designer – www.silent-partner.net) and how it was designed to look like cobblestones that were walked on – something which resonated even further with the ideas she had for quality men’s styling. 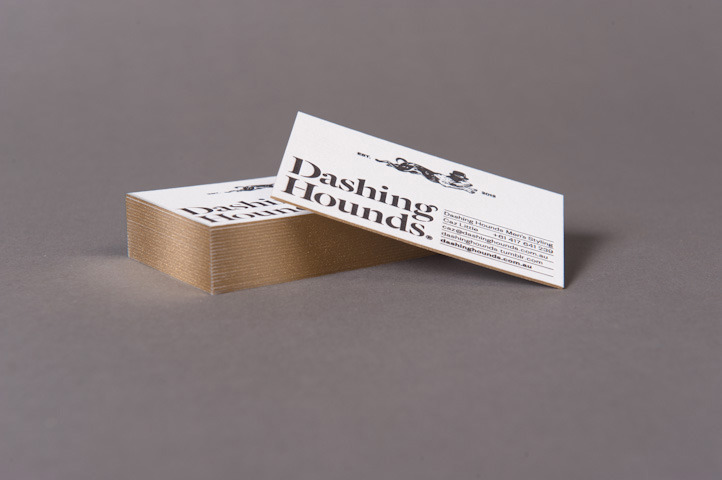 They collaborated together and he worked on the Dashing Hounds branding, with Caz really wanting a dog as the logo, a dapper looking dog at that! That’s when the ball really starting rolling. Shane put together a website and Caz anchored herself with some social media and the perfect phrase for Dashing Hounds, “Every lady loves a gentleman”. 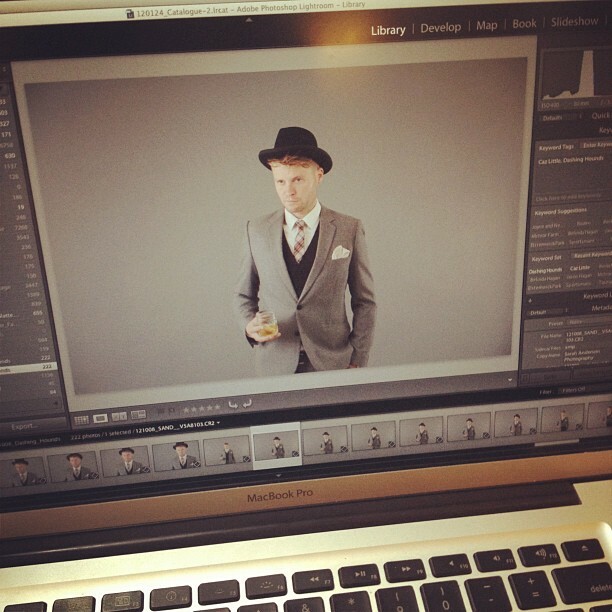 Caz was (and still is) designing menswear for RES Denim a few days a week. 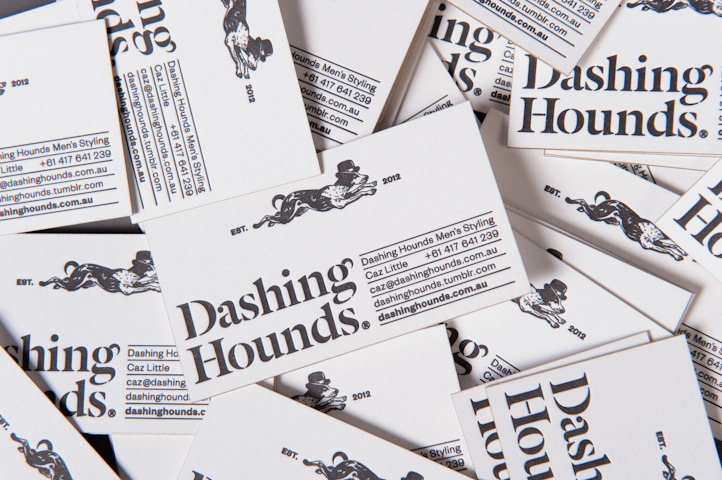 All the while building relationships with local businesses in Melbourne promoting the Dashing Hounds service. You can see her Pack as she affectionately called them on the Dashing Hounds website including Silent Partner, Sarah Anderson, Movember, Hardy Amies, Hugo Boss, Sole Devotion, Aquila, Woodstock and David Jones amongst others. She is a strong believer of supporting local business and has built strong connections with wholesalers of shirts and suits amongst other areas, which came in handy especially in the early days of Dashing Hounds when she found herself styling many weddings. A former colleague and now friend who works for Hugo Boss as Head of Marketing highlighted that a majority of her clients follow football and that if she were to start dressing footballers, it would start to create more business for Dashing Hounds. This in turn led Caz back to Channel Nine, this time focusing on menswear and dressing men such as those on The Footy Show, further demonstrating her strong styling talents. That being said, it’s not all footy and weddings! Earlier this year, actor Bobby Morley contacted Caz to say he was flying in from LA for the premiere of his new film ‘Blinder’ and needed her help. He had remembered she did styling for lifestyle shoots a while back and liked her work. Caz chose Hugo Boss resulting in three full outfits, a fantastic look for each. Caz and her business mentor Sarah Anderson, who also looks after her photography (www.sarahanderson.com.au) meet on a weekly basis to stay focused, discuss how their past week was, what is coming up, challenges they have faced and successes they have had. Caz finds this a great way to keep things flowing and making yourself accountable in a business where you are the sole person – and motivated. And the other thing that is vital in her business says Caz, “get out there and hustle!”. One of the major milestones in her menswear future was a trip to Europe in 2007. Attending the mens fashion trading fair “Pitti Uomo” in Florence, Italy it confirmed her love of mens fashion. To see the way men dress in Europe was a turning point and she found herself wishing that the men in Australia would dress the same! So what can you expect when you contact Caz for the Dashing Hounds service? She is going to ask you some questions before you even meet up to get to know who you are, what inspires you and this helps her determine how she is going to plan out your day (or 1/2 day) together. A day with Dashing Hounds is fun, and what is fun is really guided by what you share with Caz. First up you are going to have a chat over coffee, maybe then have a haircut at Dr Follicles before heading to get you styled up so you not only look good but it all will suit your lifestyle. 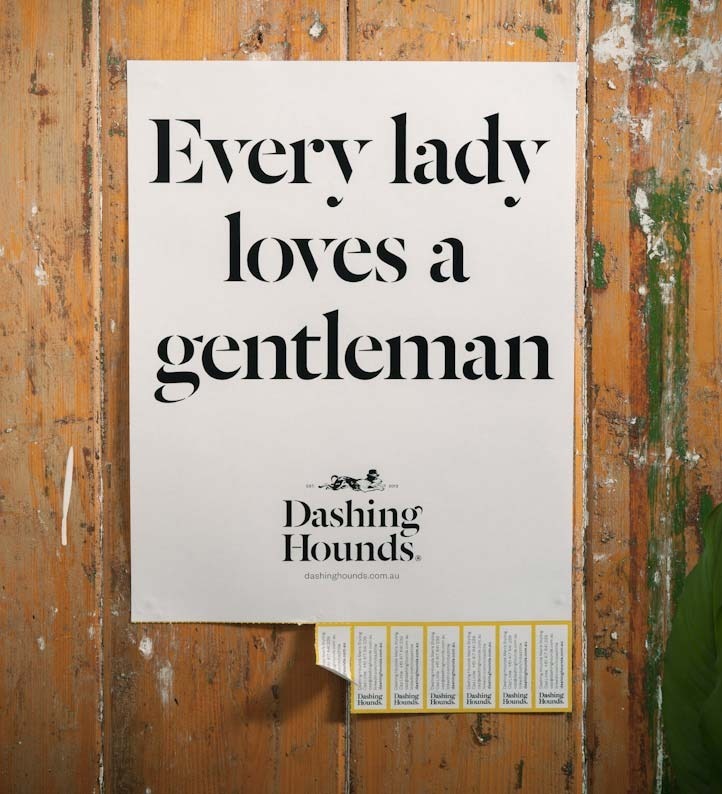 I highly recommend Dashing Hounds for every man. Caz knows her menswear, is one of the most fun girls to spend time with, loves shopping and what else can I say other than go and check out more of what she does!